The RWD-8 was aixed construction (steel and wood) high-wing parasol monoplane, conventional in layout, canvas and plywood covered. Crew of two, sitting in tandem in an open cockpit, with individual windshields. Twin controls. 4 cylinder air-cooled 90 kW (120 hp) straight engine PZInż. Junior (licence built Walter Junior) (82 kW /110 hp nominal power). 120 hp Walter Major or de Havilland Gipsy Major were used on some planes. Two-blade wooden propeller. Conventional landing gear, with a rear skid. Fuel tank in fuselage: 75 l (18 US gal) (RWD-8 PWS) or 85 l (21 US gal) (RWD-8 DWL). Wings folded rearwards. RWD-8s were used in the Polish military trainer aviation from 1934, becoming a standard type of primary trainer. In November 1938, there were 349 RWD-8s in the Air Force. 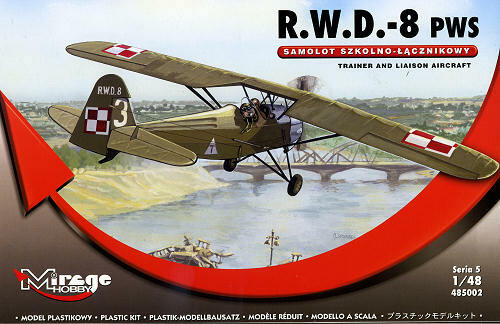 RWD-8s were also used in Polish civilian aviation - particularly in regional aeroclubs. More than 80 aircraft were bought for public collection funds, in order to train aviators. They were also used in the Polish aviation sport. Small number were exported: three were sold to Palestine, one to Spain, Morocco and Brazil. Licenses for building the RWD-8 was sold to Estonia (one aircraft was produced, with markings ES-RWD) and Rogozarski of Yugoslavia (a small series with radial engines was built). At least one RWD-8 was sold to Spain via Portugal during the Spanish Civil War. It was used as a recce plane and a trainer for the Nationalist forces. In the Invasion of Poland 1939, the RWD-8s were used in 13 liaison flights, three aircraft in each, assigned to Armies. Many other aircraft were mobilized during the campaign and used in improvised liaison units. An advantage of the RWD-8 was its capability for short take off and landing on unprepared fields, but the missions of their crews were dangerous. RWD-8s of the Polesie Operational Group were the last Polish aircraft in the sky during the campaign. They were flying reconnaissance missions during the battle of Kock, and even threw hand grenades. A great number of RWD-8s were bombed by the Germans in air bases (unlike Polish combat aircraft) or burned by withdrawing Poles. 57 aircraft were withdrawn to Romania, about 40 to Latvia and 2 to Hungary. Only some dozen planes were captured by the Germans in airworthy condition. In Romania and Hungary they were used until late 1940s. None returned to Poland after the war, and none have survived to today. Molded in a medium grey plastic, the level of detail is good though a bit on the soft side. I'm not sure if this is a new mold kit or not though I seriously hope not. I found a number of ejector pin marks and towers on pieces that will have to be removed and sanded down before construction, such as what is on this one aileron. You can see the tower on one end and perhaps the depression for the other pin mark near the right side hinge. This is, of course, the worst of the lot, but they a re there. I also found that some of the smaller parts had so much flash that they were basically lost in a blob of plastic. These rudder pedals are the worst, but some of the other smaller bits are similar. I also found some sink areas on the thicker pieces of plastic that will require filler. 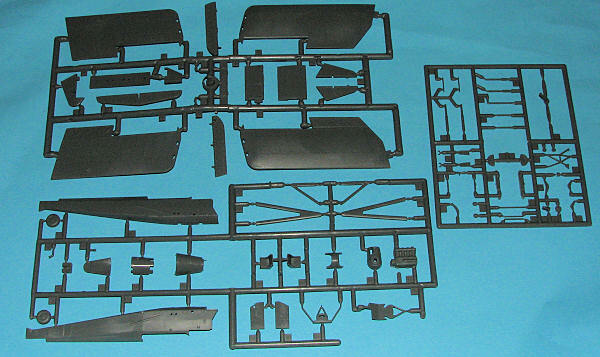 As to the kit itself, it comes with full cockpit detail and there is framework detailing on the inside of the fuselage halves. Both the seats have belt detail molded in place. 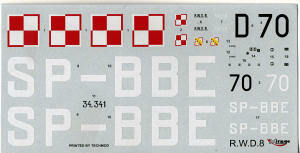 Instrument panels are devoid of detailing, but there are individual instrument decals on the decal sheet to be placed where appropriate. The kit also has a full engine with panels on the side that can be left off if one so wishes. Those not wanting the engine can probably leave it out as the prop hub will be attached to the very front of the engine cowling. The upper fuselage section where the various instrument panels and the interplane struts are located is a rather complex construct. However, it appears from the instructions to be well thought out and should be quite sturdy, which it will need to be to carry the rather large amount of plastic that is contained in the eight piece wing assembly. This wing has two outer halves on each side of a separate center section. The ailerons are also separate. As on most models with separate control surfaces, they are designed to be built in the neutral position. Flight surface detail is that where one sees all the ribs and stringers, which seems to be the rage in today's kits. Landing gear is quite sturdy looking and should build up without any real problems. Each of the rear control surfaces has a separate bell crank to attach and one will need to run control wires to the small assemblies that jut out of the side of the fuselage. Apparently there are supposed to be clear bits for the windscreens, but there were none in my box. Instructions are well drawn and have a history of the plane, paint in Vallejo colors and seven construction steps. No control line rigging guide is provided, but you can get that from the box art. Markings are for a civil aircraft in 1939 with a olive green color. The other is a military version with a silver-grey color. Both have aluminum engine cowlings. Decals are superbly printed by Techmod. I found it interesting that the box art plane is not what is on the decal sheet! So there you have it. For those who like Polish observation and trainer types and also would like to do an inter-war civil type in 1/48, then this may well be the kit for you. You'll have to use those modeling skills to get there.